Learn about SOLIDWORKS data management workflow in this new white paper! Design and manufacturing companies today rely heavily on simulation results as the basis for business decisions. Managing an expanding simulation environment of tools, data, and processes is becoming more and more important. Simulation results need to be integrated with the enterprise’s overall product development environment; however, companies of all sizes are still struggling to manage their simulation data, which is increasing in size and complexity by orders of magnitude as more simulations are performed over time. 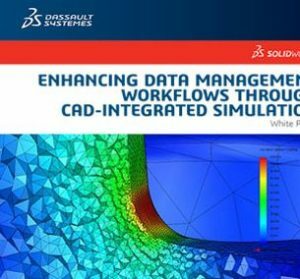 Enhancing SOLIDWORKS data management workflow with CAD-integrated simulation, and learn about how with this new white paper from SOLIDWORKS. This paper proposes a novel approach to managing simulation data workflows. Processes can be enhanced through the use of integrated CAD tools so that the data management, CAD, and simulation tools can talk to each other. This system provides a powerful platform for companies to leverage and effectively implement the key data management practices. Many companies have adopted this strategy by implementing engineering workflows using data management, CAD, and simulation tools. They are more successful than laggards in their respective industries. However, they are still looking for a more integrated system to organize, control, find, share, and secure intellectual data. Manufacturing industries are under continuous pressure to deliver innovative, competitive products faster. To meet this goal, they are increasing the use of simulation to better understand and validate product behavior up front in the design cycle. This approach allows for more information and insights to be captured early on, which in turn leads to making more informed design decisions. The key question is whether there is a simulation workflow process in place to capture and manage all of this data. Equally important, can intellectual simulation data somehow be reused to avoid duplicate efforts and save time for designers and engineers, both new simulation users and expert users? Do companies have some sort of best practices for this? Effective management of simulation data is increasingly important as simulation becomes a core business process and organizations rely on simulation results as the basis for business decisions. Check out the SOLIDWORKS white paper to find out more about SOLIDWORKS data management workflow.